Welcome to the October 31, 2007 edition of the Carnival of Divided Government Septimus Decimus - Scary Halloween Edition. This the latest in a continuing series of irregularly scheduled compilations of bloody blog posts, ghostly essays, and horrifying articles on divided government conjured up from the blogosphere and the demon infested inferno of main stream media. While scary, this carnival cannot compare to the heart stopping fear induced by yet another Presidential debate. Last night, it was the Democrats in Philadelphia on MSNBC. I had to choose between attempting yet another death defying live-blogging the live-bloggers or get this Carnival edition out on time. Since you are reading this (hopefully on Halloween) - you already know I chose to fulfill my Carnival responsibility. I chose wisely, but did watch the debate. Seeing Edwards, Dodd and Obama stalking Clinton, shooting silver bullets, and attempting to put a stake through the heart of the vampire queen put me in the right mood for this carnival theme. Equally frightening, was watching the undead candidacy of Richardson and Kucinich desperately searching for fresh blood and invoking UFO's. Spooky. As usual, a good summary and coverage by Andrew Sullivan, Joe Gandelman and Nick Gillespie. Ten Spine Tingling Divided Government Posts. "My good friend Rob Bluey notes that the U.S. House has had more than 1,000 roll call votes so far this year. On the surface, it looks like the Democrats are doing something, but if you investigate further, you'll see that they aren't doing much of anything. Of course, this is a double edge sword. 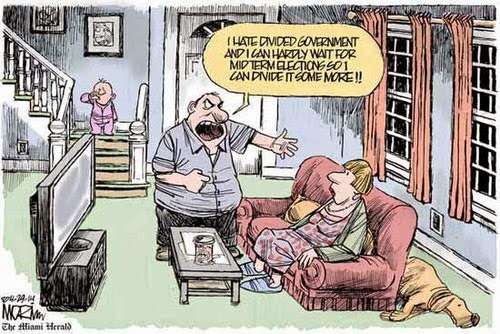 Divided government is preventing a lot of bad proposals from passing, but it's also preventing a lot of good ones, too." Nothing to be afraid of Andrew. That is the way divided government is supposed to work. You see, the Democrats may not agree that the bills that are being prevented from passing are all "good ones". When Democrats and Republicans craft bills that both agree is a "good one", it will pass. "Yeah, there are things about Rudy that concern me. There are aspects of all the candidates that concern me. Most libertarians I know are accustomed to making tough, pragmatic choices as to which half-a-loaf they're going to cast their lot with. So what's a small-l libertarian to do? All the Democrats, without exception, want to roll back the Bush tax cuts, so that puts them at an extreme disadvantage with me right off the bat. 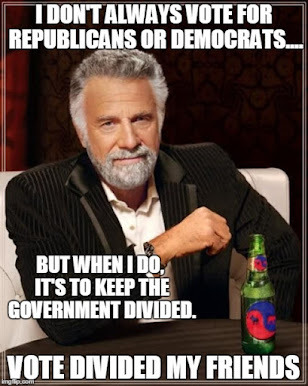 Furthermore, I think divided government is the best friend a libertarian can have in the real world. With Congress firmly in Democratic hands, I'm reluctant to send a Democrat to the White House unless I just have to." "I was just encouraged that Bush could actually veto a spending bill, because I was really beginning to doubt it. But this is exactly why I think divided government is the least of all evils. Does anyone doubt for a minute that Bush would have happily signed the exact same bill had it been sent to him by a Republican congress? I don't. God knows he signed off much worse budgetary abominations during the past six years." "Finally, the Democrats will probably hold onto the House and Senate in 2008 (because the GOP screwed up -- and they know it), so by putting a Giuliani in the White House, we'll be giving divided government a chance. Disclosure about how well I'm trying to manipulate you: the headline of this post has an Emotional Marketing Value Score of 47.06% with equal appeals to your intellectual and empathetic spheres . . ."
I had no idea WTF Christopher was talking about with that title score, but I did find it oddly compelling. Following the link, I determimed that the title of this post has a barely competent EMV score of 30%. 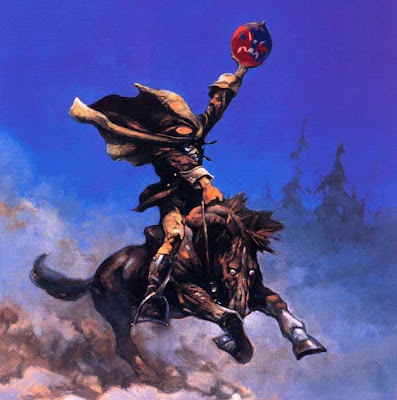 "...the challenge of that definition of conservativism is that it’s by definition a reactionary ideology, which may help to explain why it’s most effective when it is in a position of checking (as in a minority or divided government) or reforming (see: Contract with America) as opposed to enacting and executing laws derived from a consistent set of principles." It is as good a theory as any to explain why good "Dr. Jekyll" conservatives turn into evil "Mr. Hyde" Big Spending, Big Deficit, Big Government Republicans when they hold all the cards in Washington. "D’où le Congrès tire-t-il son pouvoir opérationnel, disons son pouvoir de gouverner puisque c’est le terme employé à propos du partage des tâches entre la Maison Blanche et la Colline (à titre d’exemple, l’équivalent de ce que nous appelons cohabitation se dit "divided government")? Tout simplement de ce que c’est lui, pas le pouvoir exécutif, qui décide des programmes, de la création des agences chargées de les mettre en œuvre et de leur financement, de ce qu’il consent, au Sénat, à la nomination de leur dirigeant et procède finalement à leur évaluation permanente au fil d’innombrables hearings." "Partisanship is nothing new. Fear of an overcharged executive branch is nothing new. For those playing along at home [my party]=Republican Party, [other party]=Democratic Party, and [foreign entanglement]=joining the League of Nations. The more things change . . . I wonder how much of this script will Sen. Clinton pick up? Will she suggest ending 'divided government' be a good thing? Will she suggest that she will rein in the executive branch? Will she offer a foreign policy that gives "peace in industry"? Will she offer the people "relief from anxiety and gratitude for a common-sense future"?" Will the ghosts of election pasts possess the Democratic front runner? We shall see. "Americans have lost patience with a failing healthcare system in our divided government, but some answers - such as a universal healthcare system - meet resistance in some quarters. The dissatisfaction is so palpable that other countries have picked up on the raw statistics to use as comparisons to their systems. This article addresses prominent healthcare problems and how each Republican and Democratic presidential candidate stands on those issues." No matter. Rules are rules. If you mention divided government, you're in the carnival. Regardless, this is a great post, as Jimmy offers an excellent and comprehensive overview of health care issues and the positions staked out by the major presidential candidates. Well worth the read. "The federal deficit came in at $162.8 billion, down over 1/3 from last year, and $98 billion lower than where Bush in 2003 or 2004 promised it would be in the 2009-2010 budget, i.e., two years from now. September revenues were right at what I expected, but September spending was even lower than expected. Those who think that divided government in Washington is a good thing have a measure of vindication in the fact that total 2006-2007 spending was only 2.8% higher than 2005-2006 — not much higher than inflation, and the lowest rate of increase in a very long time." "Tomasky points out that “movement conservatism” has been around since the 1950s, but not until the Bush Administration did movement conservatives have complete control of the federal government. Reagan had a Democratic Congress, and when the Republicans took over the Congress in the 1990s they had to deal with a Democratic president. Divided government moderated what the Right could achieve and provided righties with someone to blame for whatever went wrong." Good observation, and with any luck, in 2009, divided government will moderate what the left can achieve and provided lefties with someone to blame for whatever goes wrong. I love it when a plan comes together. Finally, we would be remiss if we did not modestly note some of the reaction to an excellent recent post on the subject by um... me. Bloggers joining the conversation initiated by said post "Voting By Objective" include: Mike the Actuary musing "On the Benefits of Divided Government"; Michael van der Galiën asking "Why Should You Vote for Divided Government"; Pete Abel posting at Central Sanity with "Divided-Government vs. Best-Candidate Voting", and at the Moderate Voice with "Situational vs. Ideological Voting". Finally, although we try to keep this carnival focused on the specific topic of divided government, we traditionally include one off topic post as a grudging acknowledgment and symbolic proxy for the many off-topic posts submitted. This month we venture overseas, with a post that does not speak to US divided government issues at all, is focused on a purely local issue, but nevertheless speaks to the efficacy of restraining bad government at bay by keeping politicians at each others throat. "We are winning our environmental argument by setting one local council against another using the power of local blogging. Divide and Rule works both ways!" As a fisherman, with an abiding affection for natural, healthy, free-flowing trout infested rivers, I really enjoyed reading Riversider's account of the efforts to save the Ribble. Check it out. With that we conclude this edition. Thanks for stopping by, and thanks for all of the submissions (on-topic or not). The next edition will be the Carnival of Divided Government Duodêvîcêsimus - Special Winter Solstice Edition, to be posted on or about December 22nd, 2007. It'll be a long stretch between now and then - unavoidable since my wife and I will be leaving next week for a month long trip exploring West Africa, and the blog will likely be on hiatus. Unavoidable unless - somebody would like to volunteer to host a Carnival of Divided Government between now and then. If you are up for it, Send me an email at DWSUWF AT Gmail DOT com. In either case, Blog articles may be submitted for the next carnival of divided government using the carnival submission form. Past posts can be found on our blog carnival index page. I know this is well past Halloween, but I needed to add a few more links. The Maiden's monthly compilation "Not my country. Not my country. " at Hell's Handmaiden. James Joyner's "Beltway Traffic Jam" at Outside the Beltway. Andrews Ian Dodgebloom's "Carnival of the Vanities" at Dodgeblogium. Pat Santy's "Carnival of the Insanities" posted at Dr. Sanity. Natural Collection's Carnival of the Green. BMD's Economics and Social Policy #XXXVII posted at The Boring Made Dull.